Alan Dickens says Saints have the character to ensure they don’t suffer back-to-back defeats for the first time this season when they travel to Leicester Tigers on Saturday. Jim Mallinder’s men were thrashed 32-8 by Racing Metro at Franklin’s Gardens last weekend in what was only their fifth defeat of the season. The other four reverses - to Racing, Wasps, Exeter and Sale - have all been followed by stirring ripostes the following weekend. And Dickens believes the fresh crop of players, shorn of their Six Nations stars, can stave off successive losses in the LV= Cup clash at Welford Road. “Whether this season or last season, whenever the lads have experienced a disappointment they have bounced back the following week,” said the defence coach. “It shows the character they’ve got that they put in a performance the following week. “This is a great occasion and you saw how the last few games we’ve played against Leicester have been exciting and full on. 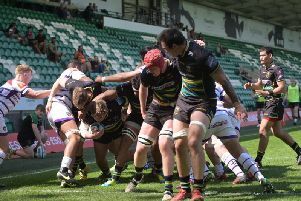 Saints have named a number of Academy graduates in their squad to take on Tigers and that will only add to the passion in the away dressing room. Dickens said: “Everyone knows what it means and that’s not just the Saints players, it’s the Tigers lads, too. “It’s a healthy rivalry and we’ve had some great games over recent years. “We haven’t had the best results at Welford Road, but I’m not sure many teams have. “It’s a tough, hostile place to go and hopefully the boys will enjoy it. “The enthusiasm throughout the squad is evident. The lads have been bouncing around.